If you are short of time, the answers to the following 3 questions should let you know all you need to about the ProClinical 250+ from Colgate. If we have missed something, let us know in the comments.If you want more detail, you can read the full Colgate ProClinical 250+ review further down the page or watch our video review. Absolutely not. In fact for the price, size and weight this brush is quite remarkable. We have given a rating of 4/5 to the 250+ as it is slim and good value. The 250+ is a really excellent brush with little in the way of faults when you consider the price asked for it. Of all the Colgate brushes this is our recommendation. But, at this price point, there is quite a bit of choice. Whilst a touch more expensive, our choice is Oral-B’s Pro 2 2500. It feels like it cleans better and has a pressure sensor on board. Sonicare’s EasyClean is also an option. Don’t let these alternative suggestions, imply the 250+ is bad, it really isn’t. Each have their pros and cons and it is about weighing up what is best for you. Where the 250+ stands out for me is the compact profile and battery life. You might have an overarching requirement such as budget, best for whitening or suitable for braces. We have put together a series of lists which cater for just this. 3. Where’s the best place to buy the ProClinical 250+? Colgate is a brand that many of us have grown up with and as a result many of the leading high street and online retailers stock the 250+. Typically we tend to recommend Amazon because it is very competitive on price and has special offers running. It also offers free delivery. However, it’s always worth checking out other retailers as well. Check the links below for the cheapest price among UK retailers. It’s always worth checking eBay, too. As 2017 begins, Colgate have pushed out a slightly revised range of brushes. What was once the Colgate ProClinical C250, the C has been dropped and the brushes have had refreshed designs and new packaging, to make them a little more appealing. The improvements on the whole are positive. The boxes look at lot less dated and stand out with bold white and red colours. The 250+ is the second brush in the Colgate range, delivering performance at a price. As part of the range refresh the 250+ replaces the C250 we have previously reviewed. It is far from the most feature rich, but this makes the brush a no nonsense option for your daily healthcare routine. Slim, compact and lightweight, it is like handling a manual brush with the benefits of an electric. Slim and lightweight design – Only when you handle this brush do you appreciate just how slim and light it is. It is almost like handling a manual brush. Great for adults and kids alike to easily grip onto. Is it too slim though?! Different colour options – Available in white, black and pink colour options to suite your preference. Travel cap – Simple solutions are often the best and this slide on travel cap rather than case is a convenient way of protecting the brush when travelling without the bulk. Design – The small and slim profile is nice but perhaps verging on the too slim for those who have limited hand and finger movement to grip hold of. A lack of rubber grips may make it hard to hold for some. The Clean – Didn’t come away with that punchy just cleaned teeth feeling. Teeth were certainly clean and fresh for sure, but the likes of an Oral-B brush makes your teeth and gums feel like they have had a good clean, perhaps a more aggressive clean from Oral-B. This may be appealing for some. Charging stand – Holds the brush but quite a lot of play meaning the brush is prone to being easily knocked off. Not colour matched to the brush (unless you opt for the white model). It also supports only 220-240v. A large part of me wants to criticise the almost dull and boring design of the 250+ but the more I look at it and the more time I spend with it, I also want to sing its praises for being a simple no nonsense approach to an electric toothbrush. It feels like most time has gone into making this slim and functional rather than stylish and fitting of a modern bathroom. Perhaps a little harsh to say the design is dated given the range has just gone through a refresh; but I think you will probably understand where I am coming from when I say it just lacks a certain appeal. The black model I am testing is in my opinion the most appealing of the 3 colours for me, there is too a pink and white colour option. The provided travel cap is colour matched, but the charging stand is not. The front of the handle acting as home to the one single power button, battery status icon and brand logos. The rest of the handle is smooth to the touch with no grip. Too be fair the slim design and weight means this is not heavy to hold and is nearly as light as a manual brush. The rubber power button which has a grey outer ring, with a black centre, does in some way act as a grip if required. A few grips or a piece of rubber on the back would be nice, but it would also interfere with the simplicity of this mode. The Colgate logo stands out particularly well against the black body of this brush. A battery status icon is a welcome addition as some cheaper brushes do not include this. Compared to similar brushes from Oral-B and Sonicare the 250+ wins hands down for size and portability. Those with limited hand movement may find the 250+ too slim, but I can’t quite work out why the competing brands are so much bigger, especially when the Oral-B offers inferior battery life. Maybe the there is something to be said for the thicker handle? More robust and easier to hold?! A single brush head is included with the 250+. For just one to be included at this price is common. That single, user replaceable head is the Deep Clean option. One of 4 different heads available, the Deep Clean head has soft thin-tipped bristles to sweep along the gumline and power tip bristles that reach into the hard to reach areas. This works to achieve healthier gums and teeth. 4 soft grey rubber bristles act as a cup around the tooth to polish the tooth. On the back is a tongue cleaner. Run this along the surface of your tongue to refresh the mouth and remove bacteria build up. I particularly like the smaller size of this brush head, it makes it easy to position and manipulate the brush within the mouth, particularly in the harder to reach areas at the back of the mouth. With any toothbrush, the head should be replaced every 3 months. The 250+ is no exception. To change the brush head just pull the head and handle in opposite directions and push together to fit the new one. When you do replace, you can do so with another Deep Clean head, or you could replace it with the Whitening, Triple Clean or Sensitive head that is available. Now it is worth me noting just a small issue with the brush heads. The white and pink brush handles come with a white brush head, the black, well that comes with a black coloured brush head. Great. However, trying to actually obtain replacement brush heads that are black in colour is somewhat impossible. At the time of writing I cannot find one stockist, even following links from Colgate’s own website. So if you think the black coloured handle is for you, just bear in mind you might have to attach a white brush head after the provided head has worn out. At the time of writing, my daily toothbrush is an Oral-B brush and in my opinion it provides me with what I feel to be the better overall clean compared to the 250+. I have absolutely no information to back up this feeling other than just my own personal opinion. I am not in a position to deliver the science to prove that the actual clean is any better, it is just for me, during and after a clean the power and brush head action of the 250+ does not leave my mouth feeling as clean as the Oral-B brush, the experience is altogether softer. This is likely to be as a result of the Oral-B perhaps being more aggressive on the teeth and gums, aggravating the surface and the senses maybe giving a psychological feeling of having done more when the reality is nothing of the sort. This and other ProClinical brushes have been developed in conjunction with Omron HealthCare to bring the skills and experiences of both companies to produce brushes like the 250+. A single press of the power button will turn the 250+ on and launch the 2 minute long Clean mode. Another press of the button will turn the brush off. Included is a 30 second pacer and 2 minute timer. At 30 second intervals a pause in the motor alerts you to the need to change quadrant, for an even and effective clean. Whilst dentists recommend a 2 minute clean, if you want to clean for longer you can. Simply power the brush back on for longer. Do be aware too much time spent cleaning your teeth can be damaging too. A point I note with the Colgate range, particularly compared to Oral-B is the sound. The 250+ produces an audible humming sound and a strong vibration through the brush handle. This is quieter than Oral-B brushes which produce more of a mechanical sound, but do not deliver as much vibration through the handle. The 250+ will stand upright, but the lack of weight to it means it can easily be knocked over. Supplied in the box is a charging stand that has a small prong on the top of it. It is that prong that fits into a recess on the base of the ProClincal 250+ to charge the battery encased inside the handle. It does not stand any more securely on this, in fact there is quite a bit of play in the fit between the two items. I should mention that in the box with the 250+ is also a travel cap that is colour matched to the brush handle. This is not a large case like many brushes come with, but a slim sleeve that fits over the brush head and extends down the handle to cover the power button.. This protects the bristles on the brush head and avoids accidental activation. I like this simplistic approach. It is a lot less bulky. The only small issue for me is that this option does not work well if you normally share the brush with someone and need to carry a spare brush head. As you would expect, the brush comes with a warranty, a 2 year warranty. This covers mechanical faults like the battery no longer charging or the power button not working. It does not cover user damage. A small but possibly powerful component to what is on offer here is a money back guarantee. This is not well marketed and really only on properly taking a look at the box will you see this offer. This essentially allows you to try the brush and return it for a full refund of the purchase price (excluding shipping) if you are not happy. You have 30 days from the date of purchase to try the brush. If you do not like it, send it back within 45 days from date of purchase, providing you have all the original packaging as well as the original receipt. Overall there is not much to fault here. You do not get more premium features like a pressure sensor or various different cleaning modes, but at this price your options that include such are limited. Amazing, I simply can’t believe just how long this brush lasts for. 2 weeks, yes 2 weeks from this really slim and light brush. How?! Look online through the description or on the box prior to buying this brush and you don’t get much information on how long the battery will list. With my day to day testing I found that I could achieve 56 minutes of cleaning time, that is 2 weeks or 14 days based on 2 x 2 minute cleans each day. Oral-B have only recently launched a brush that gets close to, but not as long as this and their handles are much thicker. Colgate is beaten by Philips Sonicare that have brushes that achieve 3 weeks, but they are though larger in hand and probably have a physically larger battery. What I really like here, is that the 250+ can be easily popped in a travel bag and you can go away for a few days, a week or longer with this rush and not have to worry. I do not have the evidence to back this up, but I mentioned the power delivery of the clean does not feel quite as strong as some other brushes, so this could have some bearing. When you do need to re-charge a charging stand is included. Just like any other electric toothbrush charger, the stand has a 2 pin power adapter that will connect to the shaver socket in a bathroom or you can purchase 2 pin to 3 pin adapters so that the brush can be charged from a normal mains socket found here in the UK. The dock is white in colour with the Colgate logo on the front. It works on 220-240 volts, so you may need an adapter if you travel with the charger. A small prong protrudes from the top of the stand, it is this that sits just inside the base of the brush and passes the charge inductively to the battery inside the brush handle. When on the stand the brush is a bit wobbly with a bit of movement and it would not take all that much to knock the brush off the stand. Not a deal breaker but just not quite the premium finish one hopes for. When charging the battery status light illuminates red. Charging takes about 10 hours to ensure it is fully. I find myself leaving the brush on charge during the night typically. It is safe to do this. The RRP of this brush is £49. Whilst some sellers stick to this price, do a bit of shopping around and a discount of some 50% is easily achievable. We have included a list of UK retailers here. To be fair paying up to £35 is still a reasonable price for this brush given what it offers. The equivalent Sonicare is around £40 and Oral-B £30-40. Arguably this could be considered more of a budget brush when some electric toothbrush models can reach as much at £250, not from Colgate I must add. I would class it within the ‘budget’ section but at the top end of this. I am using budget almost as if it is a negative connotation but it should not be considered as such. Most who invest in a more premium model don’t use the various features long term. So no point wasting money on something you may not get value from. The 250+ like any other electric toothbrush requires replacement brush heads for each user every 3 months. Replacement heads can be purchased in packs of 2 or 4 and are priced on average between £10-£18. Remember if you want or have the black coloured handle, black coloured brush heads may be hard to find. Generally speaking the 4 pack is more cost effective and many retailers sell the Deep Clean brush head that comes with the 250 for £10. This gives a per head cost of just £2.50. Using the average cost (based on one user) and ownership over 3 years, the Pro Clinical 250+ will cost £52.50 or 5p per day to own. When you pay for something with your hard earned money you want it to do the job it is intended and do it well for the amount of time you would expect it to last. Here at Electric Teeth we like to know that things are going to stand the test of time. 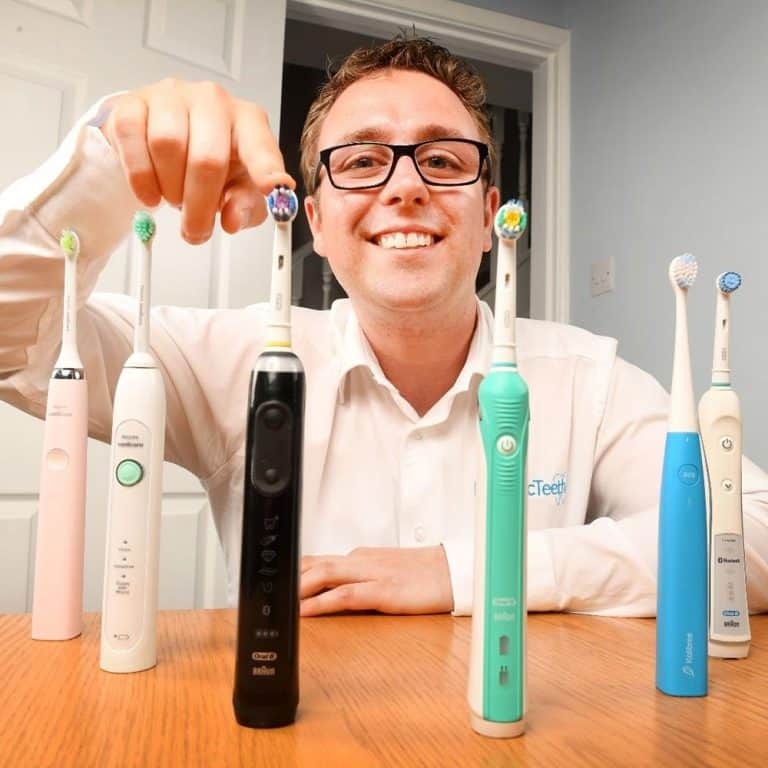 Some do better than others, but it is our aim here at Electric Teeth to test the electric toothbrush in a way that you would use it at home. The 250+ reviewed here has been used for a month and during that time showed no signs of failure. The overall build appears ok, with no obvious weak points. If any, this would be where the brush head connects to the brush handle. Do be aware the 250+ is water resistant so it can get wet and be wiped down with water but it is not waterproof so where possible avoid prolonged exposure to water to avoid doing damage. Supported for a 2 year warranty should the brush fail, for the money paid, the 250 looks strong enough to last a good few years. This brush deserves only praise really. It is not perfect as it does not appeal to all users, but it certainly does appeal to the majority by offering one cleaning mode that just works with a very respectable battery life. The option of different coloured handles means that you do not have to be stuck with the typical white. Small annoyances like the wobble when sat on the charging stand and the lack of grip on the brush handle can be set one side when a 2 week battery life, smart travel cap and compact form factor are on offer. The automatic power off feature is something you often associate with more premium brands like Philips but this little brush has it. There is a whole lot worse you could do than investing in the 250+. Is the ProClinical 250+ an oscillating brush? How many brushing modes does the ProClinical 250+ have? The 250+ comes supplied with 1 brush head, Colgate’s Deep Clean brush head. You can also purchase a Sensitive, Triple Clean and Max White One as an alternative that will work with the brush. Does the ProClinical 250+ have a pressure sensor? Does the ProClinical 250+ have Bluetooth? Does the ProClinical 250+ have sound connectivity? Does the ProClinical 250+ come with a warranty & how long is it? Does the 250+ have a built in timer? Yes, a charging station is included with the 250+. The charging station or brush head holder has not been designed to be fixed to a wall. Can I use the ProClinical 250+ in the shower? Yes and no. The 250+ is water resistant, meaning it should survive trips in the shower, but it is not waterproof and the continued exposure to water in a shower may have an effect. Ultimately it is not advised. Not exactly, the brush comes with a travel cap, which is essentially a sleeve in which the brush complete with brush head slides into. It protects the brush head and power button, but offers no additional storage like some cases do. Do you own or have you used the Colgate ProClinical 250+? The ProClinical 250+ brush spoken about in this review was provided by Colgate’s PR department. Electric Teeth did not purchase this model. No financial reward was provided to conclude the review the way that we did.